Who wouldn’t want 28 new content marketing ideas they can inject into their editorial calendar immediately? You would if you’re like most content marketers who are always in search of new quality content. We are visual beings. As a result 83% of what we learn is via visual means according to Annalect.com. Seeing an example helps us to understand it better. 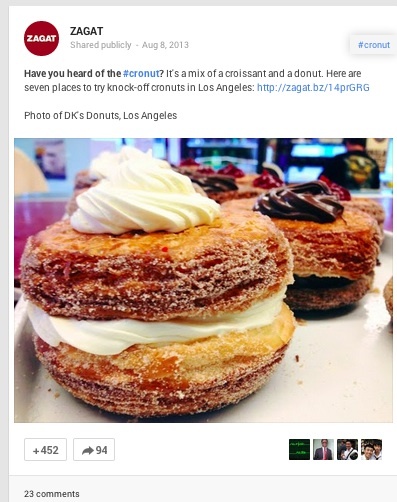 To get a crash course in how to create amazing content, here are 28 best-in-class content marketing examples including visuals chosen by well known experts in the field. 3. One of the great examples of content marketing for me is the slideshare deck by Velocity Partners called “Stop Creating Crap.” I think it is provocative, designed well and delivers great value for the target audience. Michael Brenner of SAP and the B2B Insider blog. 4. I continue to love what GORUCK does with their brand. They are a lifestyle brand that builds military tough gear for everyday use. Their blog highlights their latest products, mixed with the latest adventures from members of their team. They also do a series of live events and have recently began posting updates with branded photographs across their social channels during the events to give live updates for anyone to follow along. C.C. Chapman author of Amazing Things Will Happen and co-author of Content Rules. When I think of great content, I think in terms of how well does it reinforce your brand while it drives lead generation and sales. Here are three examples that stand out and can be replicated by other businesses. 5. 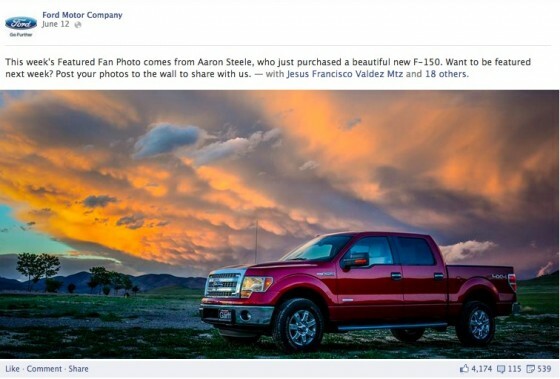 Ford’s Facebook Page. I love Ford’s cover photograph. It encompasses everything that good content should do. It’s branded by incorporating Ford’s employees. Even better, they’ve got plastic on the grass to protect it. 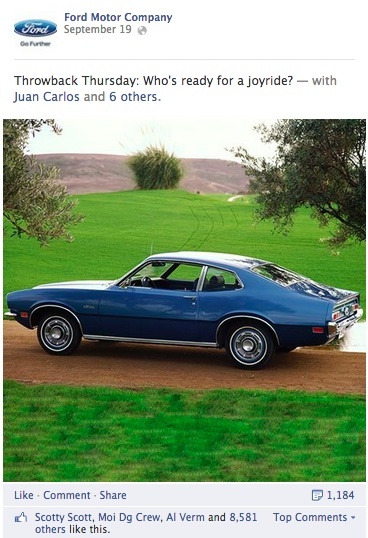 Additionally, Ford has created Throwback Thursdays to use retro photographs from their archives and on Fridays, Ford gets consumers to share their photographs including Ford products in their Featured Fan Photograph. How can you leverage content from your firm’s archives and how can you get your customers involved in content creation? The beauty of this information is that it attracts interaction and engagement. Also, it doesn’t require a ton of content creation or overhead. 6. 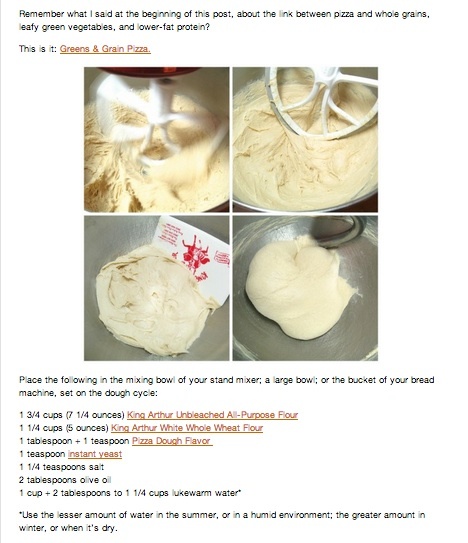 King Arthur’s Flour Blog – Flourish. 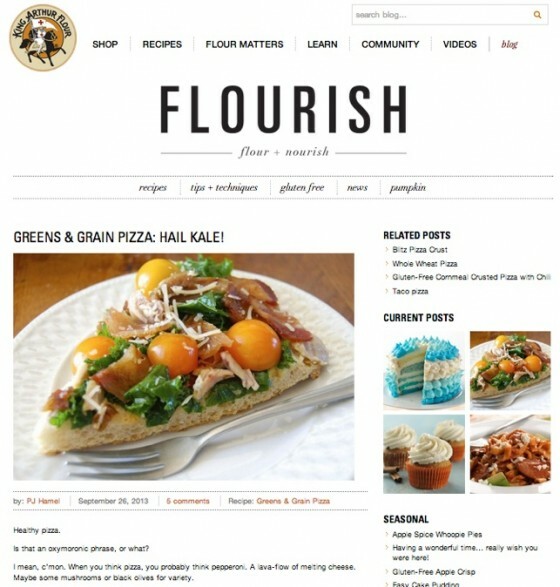 King Arthur’s Flour incorporated their product into their blog name, Flourish. They give away recipes with step by step instructions including amazing photographs of the finished product and the process. They link to their product pages where appropriate in the recipe. As if this weren’t enough, they build on existing trends and memes. For example, this Greens and Grains Pizza recipe includes kale, the hot new food trend. 7. 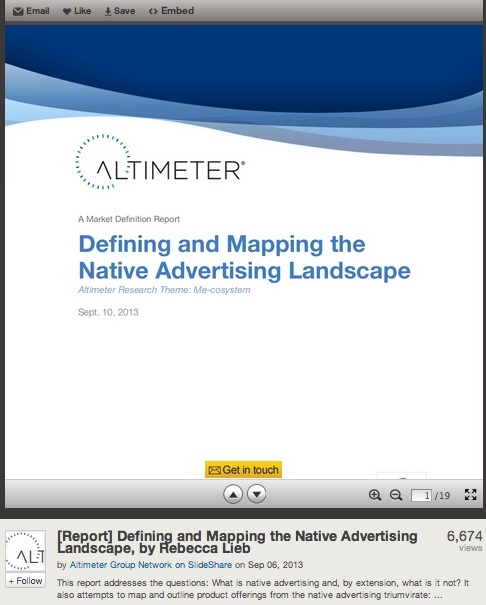 Altimeter’s Research on Slideshare. Altimeter Group is a research and advisory consulting firm. To attract customers, they share meaty, original research on Slideshare (and other platforms) like this example by Rebecca Lieb. The presentations are branded in terms of look and feel as well as in terms of their thought leadership on current business issues. This approach can be used by any services firm or solopreneur by showcasing your expertise in a consistent, branded way. 8. Since January of 2011, we have hosted a monthly open-house teaching event called “Wine & Web.” The idea was to invite clients, prospects and friends into our space and teach our latest web marketing techniques. It’s not difficult, expensive or time consuming. We simply include the link in the Thursday newsletter for the event on the following Tuesday. Our larger conference room can hold around 30 people, so we order 15-20 bottles of wine and order a half dozen pizzas. I love Wine & Web because it pushes me to teach new things, but it’s in a comfortable environment. The presentations often lead to blog posts and other content. It’s low cost for us, high value for attendees and there’s no commute required. I just walk down the hall and teach something new to a room full of happy people. Other marketing companies in town are catching on and many similar (near identical) event have appeared, including “Drink and Think” and “Sip ‘n Share.” We’ve created our own spinoff event called “Design Brew” which features beer and web design topics. 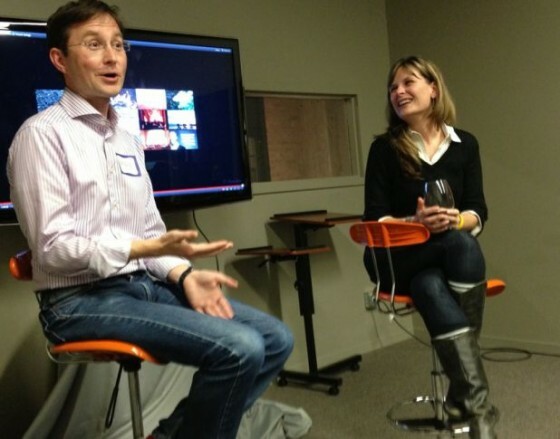 Andy Crestodina of Orbit Media and author of Content Chemistry. 9. 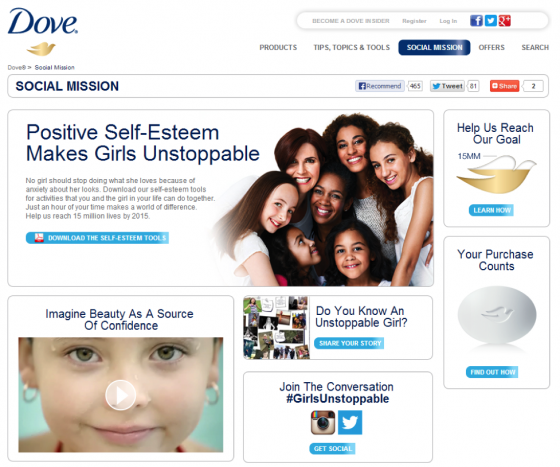 I mentioned Dove: not only did they engage in great research, but that research has formed the underlying passion points of the brand. 10. I also think Red Bull has done a superb job. They always stay on passion point of what it means for people to be extreme. They brought that to the famous example of a world-breaking freefall. Take note of the trajectory of content creation which began with an event, which spawned a website, videos, PR coverage, and more. 11. When it comes to events, GE has also provided us with a great example. They’ve taken virtual ownership of events like Pi Day and Inventors’ Day. The idea of owning an event, whether real or imagined, can be a powerful focus of content creation. 12. Super tough questions here because it remains rare that companies have content marketing down and in my world the best ones tend to be in the marketing space… Marketo comes to mind… Buffer… HubSpot, etc. As a rock and roll junkie who devours music mags, I’d give a nod to Paste Magazine whose free offerings and content curation inspires me to spend money and stay loyal. As for marketers in other walks of life, I keep my eye on my clients’ competitors. 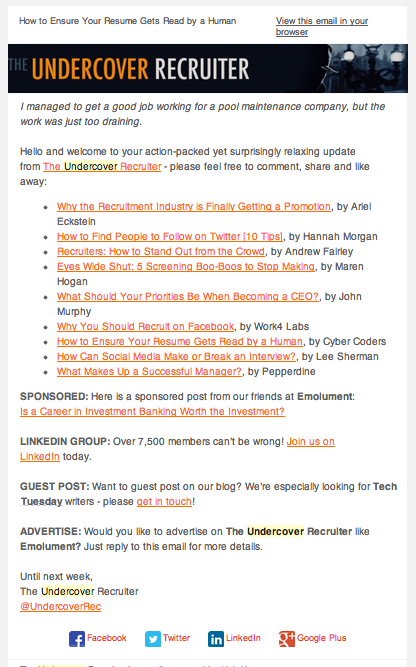 One of my clients is in the talent recruitment space, so thanks to Google Alerts, I’ve discovered theundercoverrecruiter.com. I have to say, this company gets it. They have clearly ID’d the various personas they target, recruited (sorry) top-notch talent, and ceaselessly deliver every conceivable form of useful content. Above all, they do great email. If you don’t do great email, you’re not in the big leagues. Barry Feldman, author of The Plan to Grow Your Business with Effective Online Marketing, a free e-book. 13. 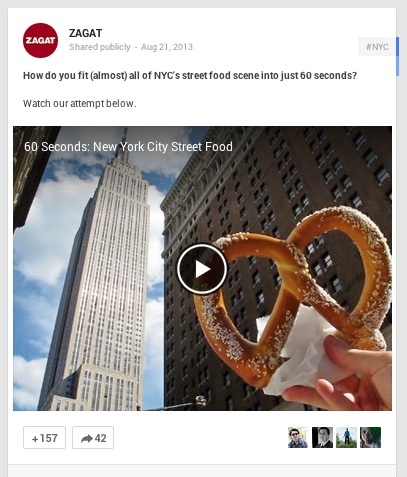 I think that Zagat does a great job with their content marketing on Google+. They are fun and interesting while staying on brand. 3.6 million people follow them on Google+ so what they’re doing works. It’s a perfect mix of information on travel and just plain food and travel posts which people love. All their content is high quality and I love their conversational tone when posting. Peg Fitzpatrick one of the ringleaders at 12Most. 14. My Froggy Stuff, for all things artistic, creative, and just plain mind boggling for doll lovers. They create absolutely mind-blowing “how-to” craft videos for doll lovers and even if you don’t love dolls, you will love these jaw-dropping videos. The company has a blog and Etsy store so if your crafting skills aren’t up to snuff, you can purchase the creations on-line. 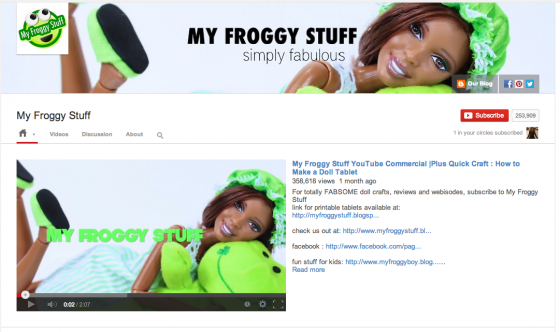 My froggy stuff has a cult following of crafters young and old and the most inspiring thing about her marketing is that there is nothing about production of crafts or content itself( video, blog, images) that can’t be done by the average person. 15. Michelle Phan was just a make-up fan passionate about tutorials back in 2007 when she launched her first video for her non-existing community and audience. Her make-up instructional have turned her into a global enterprise, inspiring the L’Oreal Group to help her launch a new cosmetic line called EM Michelle Phan. 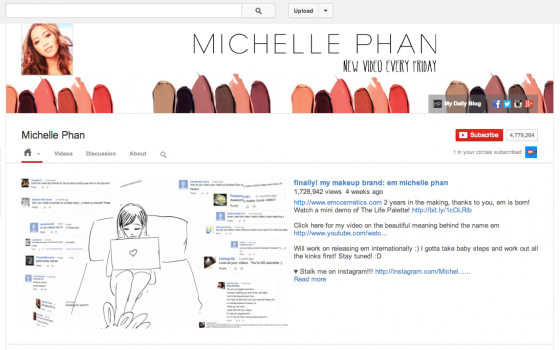 Within a span of 5 years, Michelle has successfully turned her passion into content, and her content into a brand. Michelle has produced a great three minute video on her story that outlines how her brand came about — great for content marketers and making the case on “why and how”. 16. 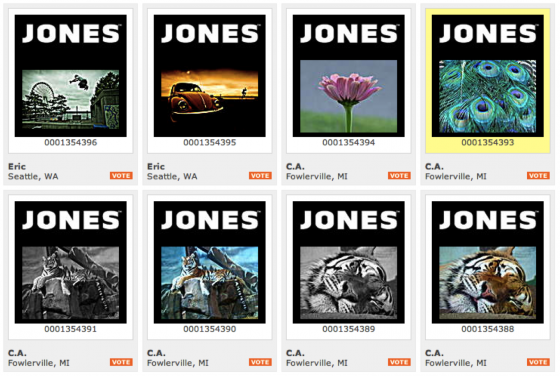 I’ve will always love Jones Soda and their use customer’s images on their bottles. They were one of the first to get the story was never about them. They were certainly my inspiration for crowdsourcing content for my board game, GiftTRAP back in 2005. 17. I’m also a huge fan of Lululemon and their use of Instagram is very cute – they also happen to have a very photographic customer demographic. 18. I also love to see brands that keep their message constant over time. This example from Geico is very cool – they reinforce their old faithful “15% saving” message with a fresh spin by telling people everyone knows that and then adds in a fun fact that’s irrelevant, but memorable. Here’s a fun collection of videos from Geico’s “Did You Know Campaign“. There is nothing better than serializing a successful creative to keep your brand on topic, but also be fun and creative. Geico has won big time, with 99,000 videos on Youtube for the search term “Geico Parody” and many millions of views. Geico is certainly working the paid, earned and owned media game to good effect. Nick Kellet of Listly. Why it’s great: The Dollar Shave Club video is not only funny and appeals to a wide audience, but it is sharable. It also communicates all of the necessary information in a short time and makes the decision to sign up something that seems to have no bad side effects. The video is written completely about the product without coming off too serious or stereotypically “salesy” and empowers the watcher with humor and light heartedness ultimately making for one awesome piece of content. Arnie Kuenn of Vertical Measures and author of Accelerate. 21. Quick Sprout’s “advanced guides” are so detailed that most people wouldn’t dare to copy them, but they generate so many links and a lot of good will, that it is worth creating them. [ NOTE: Under most circumstances, this blog wouldn’t accept a thought leader’s own work but because Patel’s advanced guides are the equivalent of text books that I would recommend, I made an exception. —HC ] Neil Patel of Kiss Metrics and Crazy Egg and blogger at QuickSprout. 23. Small Company – OpenView Labs from OpenView Venture Partners. Must read information for entrepreneurs looking for funding. 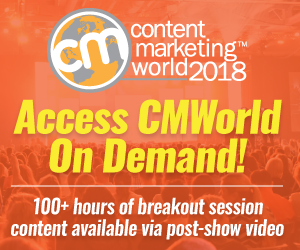 Joe Pulizzi of Content Marketing Institute and Author of Epic Content, Managing Content Marketing and Get Content Get Customers. 24. I’m fascinated with the LinkedIn Influencer program right now. They’ve engaged 400 thought leaders to share original content directly with LinkedIn’s 225+ million members, who can then connect with the authors through threaded comments. There’s tremendous value creation for the LinkedIn brand, the influencers and the members. It’s early in the program’s development, but it’s shown significant potential. According to a recent blog post by Dharmesh Shah, HubSpot co-founder and LinkedIn Influencer, he has published 30 LinkedIn articles, with an average of 123,000 pageviews. His most popular article has more than 1.2 million views and 4,200 comments. Imagine the impact as LinkedIn opens up the Influencer program to more professionals, and brands. Paul Roetzer of PR 20/20 and author of The Marketing Agency Blueprint. 25. Coca-Cola: They just create epic content. They are fantastic at weaving a story, engaging their audience, and adding human intrigue into each and every campaign. I loved the Share a Coke campaign where they recognized their customers by printing 250 of the most popular names on bottles and asking that people tweet out photos if they found a Coke with their name on it. Another facet of this campaign is providing coke cans that twist apart into 2 smaller cans to share. 26. #lowesfixinsix: I love this Vine campaign because it is innovative and useful. They found a really great way to leverage the 6 seconds that vine offers to create fixes to some of the most common household problems. 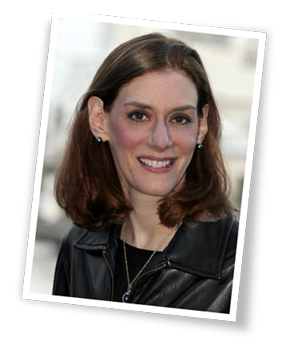 Dayna Rothman of Marketo. 27. Ocean Frontiers uses Facebook to get dive clients returning year after year. David Meerman Scott author of Real Time Marketing and PR. 28. One project that really opened my eyes and helped me in how I approach content marketing projects is Completely London by one of London’s leading estate agencies Kinleigh Folkard & Hayward. At the beginning of the worst real-estate crisis in our memory, in 2009, the agency wanted a communications vehicle that would help to build and consolidate their positioning in the UK’s capital. They hired August Media, a content marketing agency – August Media wanted to ensure the solution was not simply a wrapper for countless property adverts. Equally they wanted to keep it fresh and therefore developed a solution centered around a clear theme each quarter – multiple award-winning Completely London print custom magazine. The publication avoids the typical property listings formula, traditionally employed by estate agents, and instead, talks to Londoners about London. It’s been bringing truly awe-inspiring results and it is a firm foundation for their other channels added later – social media, a blog… See more: Nenad Senic, Disput.si. What’s amazing about this list of content marketing ideas is that it includes a wide variety of different types of businesses (B2C, B2B, NFP and Solopreneur). The content is created by agencies, consultants, in-house resources, solopreneurs and customers. It shows that if you consider what your goals are and the type of information you want to distribute, you can create amazing content. Note: Expert’s name follows their last example. Tags Andy Crestodina, Annalect.com, Arnie Kuenn, Barry Feldman, Bernie Borges, CC Chapman, David Meerman Scott, Dayna Rothman, Examples, Gini Dietrich, Heidi Cohen, Jay Baer, Joe Pulizzi, Kelly Hungerford, Michael Brenner, Michael Kolowich, Neil Patel, Nenad Senic, Nick kellet, Paul Roetzer, Peg Fitzpatrick, Ric Dragon. Bookmark the permalink. Now a days, small businesses are very popular all over the world. 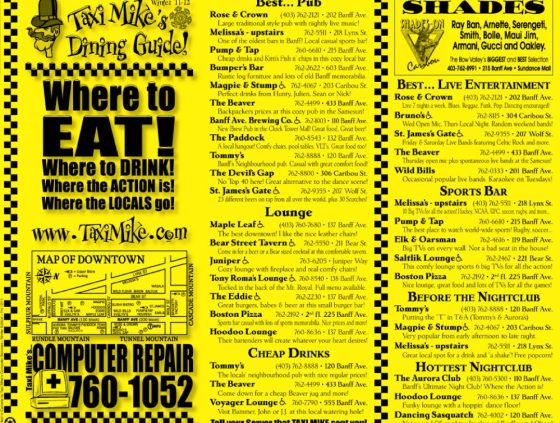 Thanks for making us concern about various innovative branding tips for small business. All small business owners should follow these tips to improve their brand awareness. It’s really amazing how content marketing is shifting the online business community. I see more businesses taking this into consideration now. This simply means that customers and reader have greater chances of finding what they’re looking for and to top it all of, most are high quality, credible stuff. Really good, useful list. Thanks! I will remember for myself the crucial neccessity of keeping your audience entertained and excited. Providing information that can be useful for your brand’s followers will generate more leads and expand your online community. Thank you for these genius marketing examples! Love these examples, Heidi! The range of company size and type is interesting, as you mentioned, and there are ones I’ve taken note of – Lowes, Lululemon, Geico – but I’m most impressed by the small businesses doing it right. Thank you for sharing! Thanks for the article! I love tactic #1, and #6 is absolutely genius. Giving away real value-add content that leads back to your product just makes sense, and it’s a win-win for all involved. How do you recommend marketing a blog? Great round of up cool content marketing ideas. Thanks! excellent list, this is the great thing about content – you are only limited by your own ideas. Great post. Wow. What a great list. We’re all getting GOOD at this content marketing thing.